I know this is totally late but we had such a good time that I thought I would share even if it is a month overdue. In very impromptu fashion I decided the Wednesday before St. Patrick's Day that I wanted to throw a party in my 42 square meter apartment. 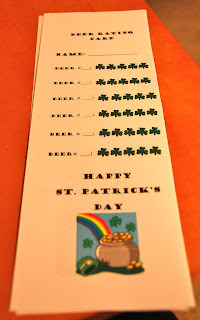 I had seen an idea about a beer tasting party and I thought what better holiday to try it out on than St. Paddy's Day. So we packed our tiny apartment with about 12 people and tasted a bunch of beer before heading down to the neighborhood Irish Pub. The way it worked, everyone brought a beer and we gave it a number and people could try as many beers as they wanted and then ranked it on a 1-5 shamrock scale. In total I think we had about 17 beers including a true green one flavored with Waldmeister. Prizes were given to the top two beers (A taste of the rainbow, Skittles). We blared some of our favorite Irish tunes and had a great night while wearing green. My last minute decorations... not too bad huh? It turned out to be a really fun idea and I look forward to doing it again. It made for a night full of great conversation, opinions, and of course laughs.